Only Pet Stop protects sensitive electronics with the industry’s toughest, most durable case built with a special thermoplastic blend. With 2X the wall thickness of lesser dog fence receivers, UltraTuff® provides superior protection from the elements and other tortures that come with hanging around in your dog's rough & tumble world. If your pet ever gets trapped in the signal field, only Pet Stop receivers will shut off and remain off until your pet is safely out. 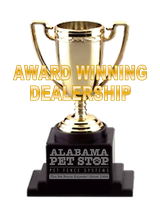 Other products offer a similar feature, but none are as comprehensive as the Pet Stop version. Your dealer will help you select the mode and settings best suited for your pet. For difficult to convince pets, the UltraTuff is capable of more powerful corrections than competitors' receivers. The Stopper feature can extend those corrections well past the actual boundary with three timed settings to be sure that the most stubborn dog learns to stay safe at home. Flashes brightly so you know when the receiver battery gets weak, giving a 3-4 day warning. Knowing when to change the battery, or recharge it in rechargeable models, is a critical requirement for safe Pet-containment. 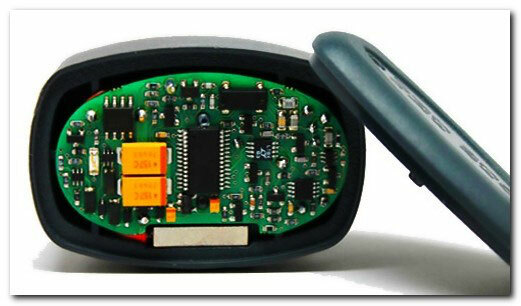 The Pet Stop exclusive FlashAlert will remind you to replace or recharge the battery before your pet gets loose. This is a true battery-monitoring system — not a timed reminder like you might find in other brands. Our receivers have three antenna with a full 360 degrees of detection. There are no blind spots or “holes” where the collar is not receiving a signal. Other receivers require the pet’s head to be perfectly straight and level when approaching the fence signal. Pet Stop is the first to offer a three-antenna receiver, which provides your pet with a full 360-degree reception of the signal, regardless of the collar position. Our patented Comfort Contact collar probes come in three sizes and are made from a specially designed rubber that is more comfortable on your pet’s neck, while still delivering corrections when needed. Gentle Spring Contact posts also come in three sizes and are retractable, made to maintain skin contact no matter how thick your dog's coat - without putting undue pressure on the neck. Including our four sizes of stainless steel posts, that's ten different contact post variations designed to suit any pet. Compare that to the two sizes offered by competitors and you'll see that Pet Stop customizes pet containment better than anyone. 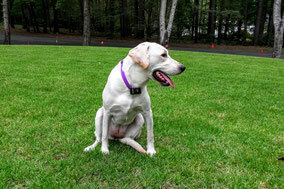 Be sure to fit your pet fence collar properly so your Pet Stop dog fence will work as designed. The best fit depends on which contact posts you have, too. 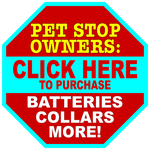 Your Pet Stop representatives can help you make sure your receiver collar fits correctly.